Call the OSHA 24-hour hotline at 1-800-321-6742 (OSHA). If the area office is closed, may I report the incident by leaving a message on an answering machine or sending an email? How does OSHA define "in-patient hospitalization"? Who should report a fatality or in-patient hospitalization of a temporary worker? What if the fatality, in-patient hospitalization, amputation, or loss of an eye does not occur during or right after the work-related incident? Under what circumstances am I not required to report an incident? What if I'm in a state not covered by federal OSHA? OSHA defines in-patient hospitalization as a formal admission to the in-patient service of a hospital or clinic for care or treatment. 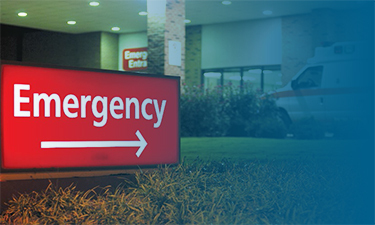 Treatment in an Emergency Room only is not reportable. What if I am in a state not covered by federal OSHA? Many states operate their own occupational safety and health programs for private sector and/or state and local government workers. Reporting requirements may vary by state, although all states must have or be in the process of developing requirements that are at least as effective as OSHA's. Refer to the status of reporting requirements in these states. For more information, visit the Office of State Programs' webpage. How does OSHA define "amputation"? An amputation is the traumatic loss of all or part of a limb or other external body part. This would include fingertip amputations with or without bone loss; medical amputations resulting from irreparable damage; and amputations of body parts that have since been reattached. If and when there is a health care professional's diagnosis available, the employer should rely on that diagnosis. Similar to the requirements in section 1904.31 for recording injuries and illnesses, the employer that provides the day-to-day supervision of the worker must report to OSHA any work-related incident resulting in a fatality, in-patient hospitalization, amputation or loss of an eye. If a fatality occurs within 30 days of the work-related incident, or if an in-patient hospitalization, amputation, or loss of an eye occurs within 24 hours of the work-related incident, then you must report the event to OSHA. Employers do not have to report an event if it: Resulted from a motor vehicle accident on a public street or highway (except in a construction work zone); Occurred on a commercial or public transportation system, such as airplane or bus; Involved hospitalization for diagnostic testing or observation only. If the Area Office is closed, may I report the incident by leaving a message on OSHA's answering machine, faxing the Area Office, or sending an e-mail? No, if the Area Office is closed, you must report the fatality, in-patient hospitalization, amputation, or loss of an eye using the 800 number (1-800-321-6742).